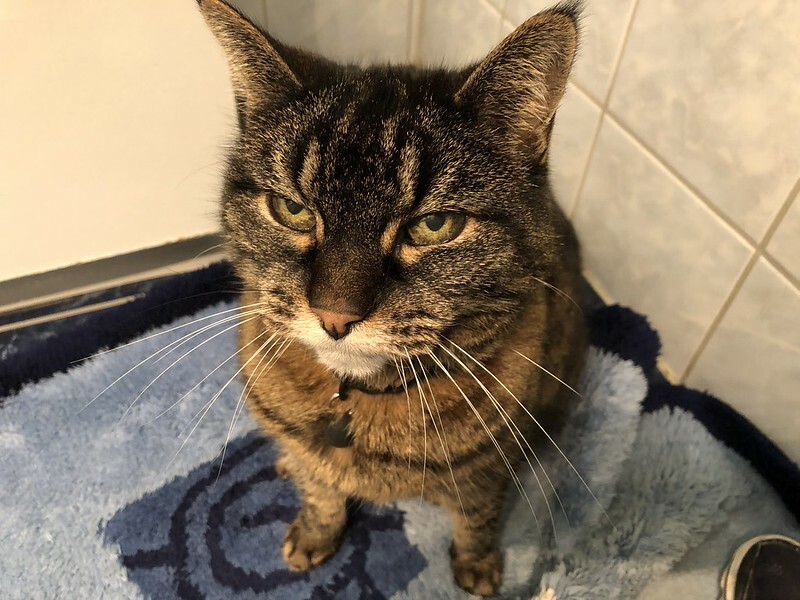 I have been blogging for the last few human years and whiskers have come and gone. It is hard work to leave my sleeping quarters daily to tell of the spectacular and miraculous adventures in my feline life, but I have to satisfy my fans. They are constantly calling out for more. 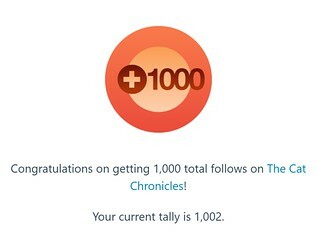 Another human year has almost gone and I reached a milestone in my blogging experiences. I now have more than 1,000 disciples on my blog that cling to my daily meows, waiting for my feline meows of wisdom. Even Mrs. Human is getting jealous, one day I will overtake her blog and become feline blogger of the year. Of course it is not easy blogging as a feline. I have such an exhausting time table. In the morning I sleep for 5 or 6 hours and must force my eyes to open for a wash. Washing is exhausting when you think of the expanse of my luxury body from the tip of my ears to the tip of my tail. I have to recover with another sleeping session of a few hours afterwards. And then there is the food. Chewing on hard unappetising vitamin pellets is not easy, a long and exhausting work. I afterwards have to collapse into my bed again to recover, although it is then after human feeding time and I usually make myself cofortable on a human bed, which gives me more scope for relaxation. Now the afternoon arrives and Mrs. Human thrusts the computer in front of me and says “Paw” and so I paw and paw and paw. Of course she is under the impression that it is all her work and takes the credit for my exhaustions, but it is I, me and myself, the great feline blogger, that supplies the ideas. Daily I have to undergo a photo session. It is not amusing to have a mobile phone camera thrust in front of you when you are sleeping and a human saying “smile”. She never did discover that there are certain musscles we do not have to produce a smile and smile is a word that does not exist in meow. And so my day comes to an end and another few hours of sleep are required. Yes life is strenuous being a feline, but I overcome the daily stress, I am a miracle on paws with whiskers. Humans live in their own world. They don’t even know how to produce a perfect hairball. At the beginning it was a group blog with my apprentice Fluffy and my litter sister Nera. In the meanwhile they have gone to the etnernal corn chambers collecting mice, but I think they blog about it all for the other felines that join them. I am now left to do it all by myself. I manage, but life can be such a struggle with eating, washing and sleeping. I really have to pull myself together to blog. Really, Mrs Human–you thrust the computer in front of poor exhausted Tabby and say, “Paw”? Goodness, just reading about her day had me ready for a good wash and collapsing in my bed. I think a little respect is due. Perhaps I should pay more attention to her needs, butting between filling her food bowl, emptying her recycling tray, giving her fresh water and a tummy rub I hardly have the time.